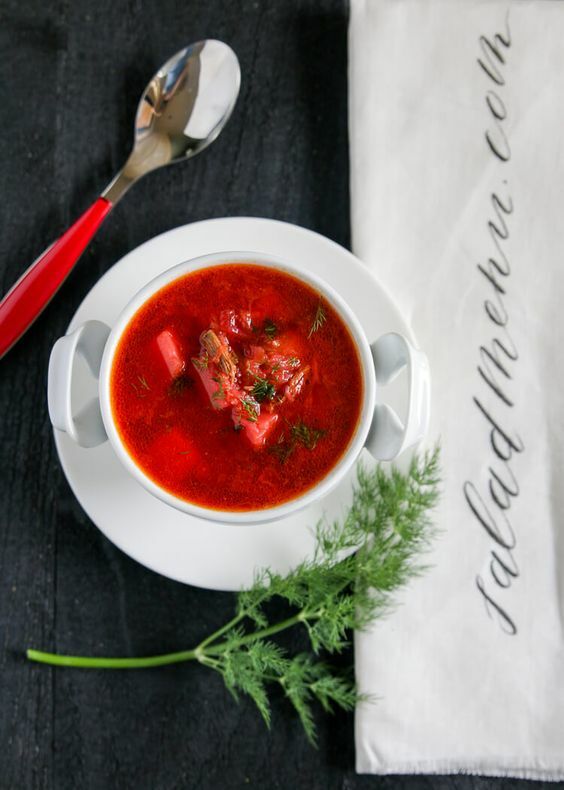 There are a lot of recipes for borscht, therefore the health benefits vary. My version comes from my mother, and she sure knew how to keep us healthy. This soup is filled with protein, vegetables, and gives you a good immune boost. I make this soup all year round, but more often during the cold and flu season. This is by far my favorite soup of all. In a large pot boil 4 quarts of water with 1 lb beef, 1 dry bay leaf, and 1 Tablespoon of salt. Boil for 30 minutes. While the meat is boiling, heat up 2 Tablespoons of olive oil in a skillet. Add in onion. Sauté for 5 minutes. Add in the grated carrots and beet. Sauté everything for another 5 minutes. Add in 1 Tablespoon of tomato paste. Stir together and set aside. After the meat has been boiling for 30 minutes, take a bowl or a different pot and strain water from the meat. Set the meat aside. Add potatoes to the water from the meat. Bring to a boil. Add in shredded cabbage. Boil until the potatoes are soft. Add in sautéed vegetables to the pot. Add 1/4 piece of red bell pepper, then salt and pepper to taste. Sprinkle the fresh chopped dill. Bring everything to a boil. Enjoy!